A grass snake called Sid, has taken to eating goldfish more than ten times the size of his head for dinner in the pond of the couple of Valerie and Raymond Bell in Appledore, near Ashford in Kent, UK. 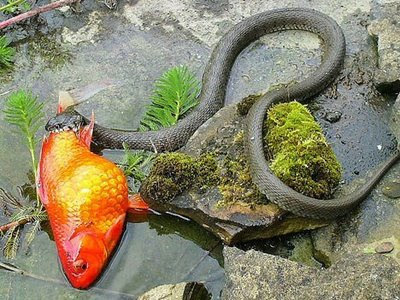 Luckily, the fish still survived after its master rapped the snake on the nose with a bean pole. Anyway, I am grieved for such a pity goldfish!